Fig. 13.3. 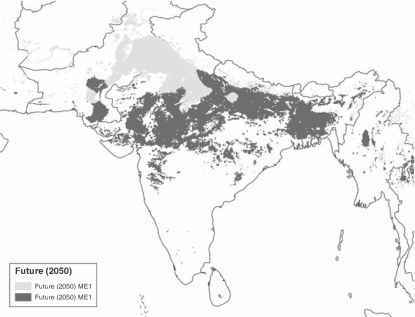 Comparison of relative distribution of irrigated spring wheat mega-environments (MEs) in South Asia. ME1 is for favourable climatic conditions, and ME5 is for regions where heat stress is expected. (a) MEs under current climatic conditions. 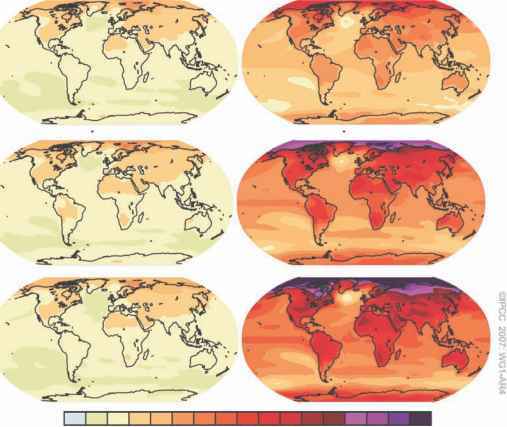 (b) MEs for a 2050 scenario (2 x CO2, com3 model; Govindasamy et al., 2003). From Hodson and White (2007) reprinted with permission from Cambridge University Press. Most simulation studies focus on crop response to abiotic factors. The study of Luo et al. (1998) is one of the few cases where a disease model, for rice blast, was coupled to a crop model, ceres-Rice, to assess potential impact of global warming. Tests were run for 30 years of generated weather data from 53 locations in five countries. Yield impacts varied with region. Blast is favoured by moist conditions with moderate temperatures, so impacts were greater in cooler rice producing regions.